i love a challenge. let’s do this! once a month, i will publish a creative menu with five meals for under $30 (serving size of 4). and that does not include coupons! $30 for the week! now, we all know pasta is cheap. we will try to vear away from ALL pasta dishes. we love this time of the year. it is freezing cold outside, which means we are prone to making comforting foods. this month, $30 for 5 meals are all comfort foods that make you feel warm and fuzzy inside! :)wanna help me out? submit your great tasting meals! creamy homemade chicken noodle soup – this soup is very simple yet delicious. packed with vegetables and tender chicken, it is truly comfort in a bowl. 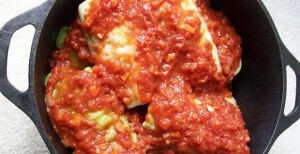 stuffed cabbage – these cabbage rolls are amazingly good. the cabbage is stuffed with ground turkey, parmesan cheese, rice, fresh garlic and other aromatics. then, it gets smothered in a homemade rich tomato sauce. the sauce is great to freeze and use for other dinners such as pizza or spaghetti! 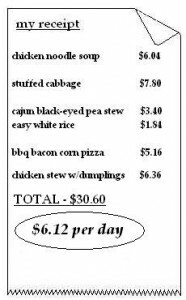 cajun black-eyed pea stew – man, do we love slow cooker recipes! 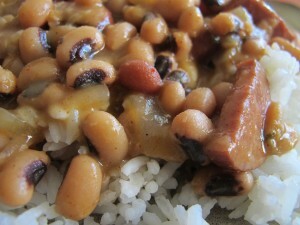 this stew cooks on low for 8 hours with black-eyed peas, sausages and spices. the result? a rich, flavorful broth that gets thickened at the end. this delicious and hearty stew is great over my easy white rice recipe. 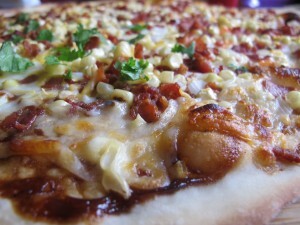 bbq bacon and corn pizza – bbq. bacon. corn. pizza. should i say more? 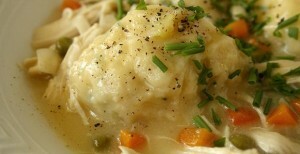 creamy chicken stew with dill dumplings – we know…another stew! but what other way could we top off this edition? only with the ultimate comfort food – chicken and dumplings! this creamy chicken stew with tender dumplings is perfect for when it is cold outside. whatever vegetables you have on hand would go great in this recipe. are we under $30? yup! check out the receipt. okay, let me know how you liked these meals along with your own unique touches. and please don’t forget to send in your great tasting meals! 🙂 see you next month! Where did the Creamy Chicken Noodle Soup Recipe go? My son loves this. Is there any way that you can provide me with this recipe? hi randy! i am so glad your son likes it. 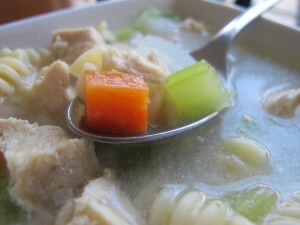 here it is – http://www.pomanmeals.com/creamy-homemade-chicken-noodle-soup/.